Last night my oldest daughter asked for a new skirt for church today. So I tucked her in bed with the promise of a new skirt waiting for her when she woke up....I scanned my stash of fabrics saved up for last minute projects such as this one, and decided that this would be the perfect time to use pom poms... So with coupon in hand I rushed to Joanns before they closed and came home with these white babies! To make this skirt I used the Simple Skirt Tutorial from MADE and then added the pom poms to the bottom edge to give it a little flare! It was super easy. I used one roll for the top layer and one roll for the bottom layer. Each roll is 4 ft. long. My daughter wears a 2T and I doubled her waist since I wanted a full skirt. So you might need more or less depending on the size you are making. Just take measurements before you go to the store. You can find these pom-poms in the ribbon section of Joanns- it's $3.99 per roll, but using coupons make it a little more reasonable. 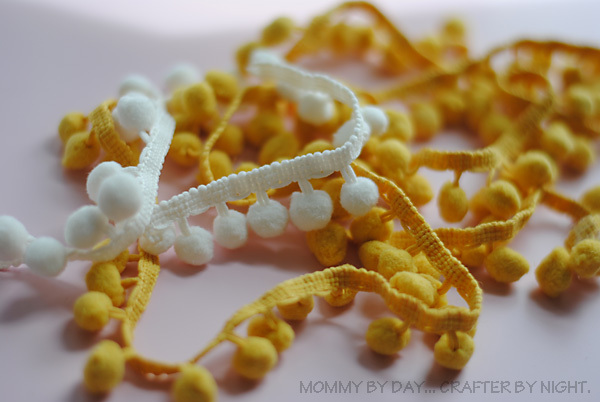 They also sell bigger and smaller pom-pom ribbon by the yard as well... I can't get enough!! I love how it turned out, but most importantly my daughter LOVED it! The look on her face this morning was priceless. It was very evident that she felt pretty wearing this skirt too. SO cute! Have also been eyeing these up for a while but thought they were too feminine for a cushion in my living room/my husband! This is perfect! That skirt is so adorable! The pom poms are the perfect touch! I want to make one for myself! Ash, it's darling. I love the fabric you chose also. Perfect. this is adorable!! I wish I was competent on my sewing machine enough pump out a cute new skirt just like that!! You are so talented-- and she looks adorable! Hey Lady! I am looking for some guest bloggers for October to share fun Halloween crafts and recipes. What do you think? Want to join in the fun? This may be the cutest skirt on Earth. I love it!! This is darling, I love it! If you get a chance, I'd love to have you link it up to my party at http://scrapbookingez.blogspot.com/2011/09/everyone-wins-giveaway-linky-party.html. Thanks for sharing! That is soo cute. I love pom poms as well. Wish I had a little girl to put this in. I've never used pom poms, but they're on my shopping list now. They finish this skirt off beautifully. 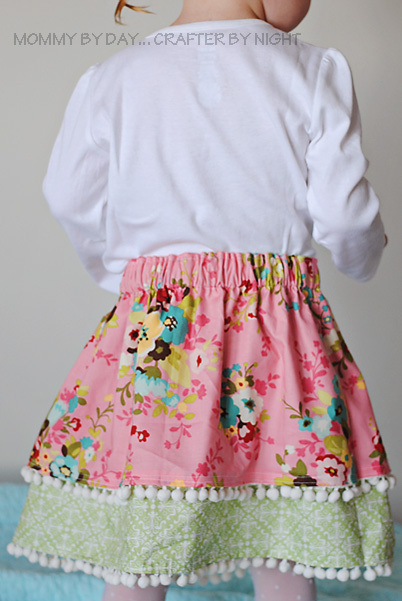 I imagine this skirt will be the envy of other little girls. Beautiful! I love it! And the fabric looks fabulous too! I saw this on pinterest and I absolutely love it!!! 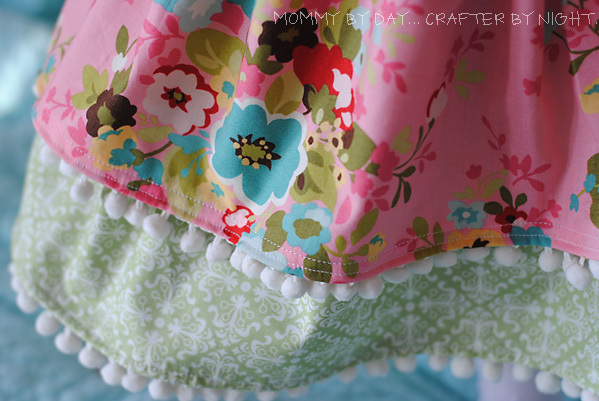 I love the fabrics, the pom poms, the colors... Wow! This is such a precious idea! And I love your blog name too..teehee. Really cute-I love the two layers! 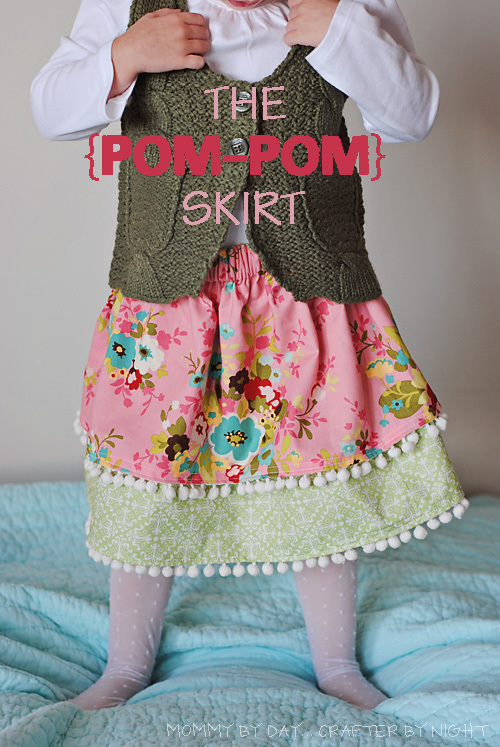 Love this and I have always wanted to use pom poms, but I'm afraid of how they hold up in the wash. Do you have the hand wash the skirt? Thanks for sharing the tutorial! You are super talented. Love everything about it!! Do you know what the fabrics are called?